...sometimes it's difficult to make time for the important things in life. Your pet, your spouse, your kids, your girlfriend in Brandon, your collection of Magic: The Gathering cards, and even jolly old Jehovah can get left by the wayside. 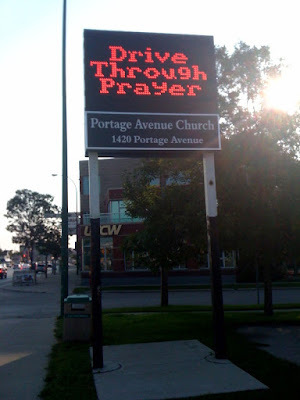 But Portage Avenue Church has the solution! I've got to say, good on them for changing with the changing times and adapting to their new environment—evolving, if you will. But if I'm stuck in traffic and I've got a hankering for a drive through, I'd rather head 500 metres west to A&W; they've got one fantastic veggie burger.